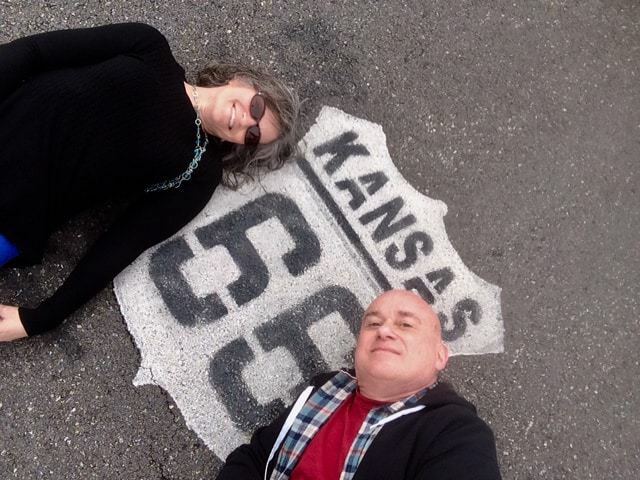 When we received our invitation to join Travel Kansas for a Route 66 Instameet, it was an offer we couldn’t pass up. Our first Instameet was last year, when we toured various places in Kansas City, Kansas. (Read more about that event here>) This time we were visiting two towns in Southeast Kansas. We wanted to make the most of our drive, so we spent the previous day exploring Joplin, which is the western end of Route 66 in Missouri. 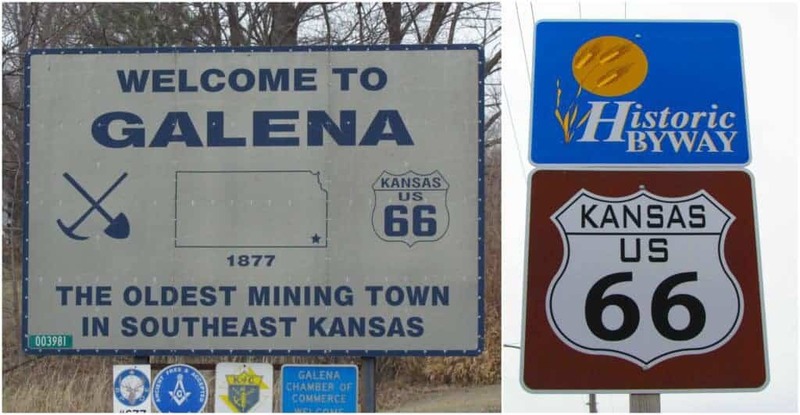 After a hearty breakfast, we crossed the state line into Kansas, and arrived in Galena. The city of Galena sprung to life after lead was discovered in 1877. Interestingly enough, the railroad had actually built a line through the area in 1871. Originally named Short Creek, it was soon changed to Bonanza, before finally ending with its current name. The name refers to the lead ore mineral that was so prevalent in the region. 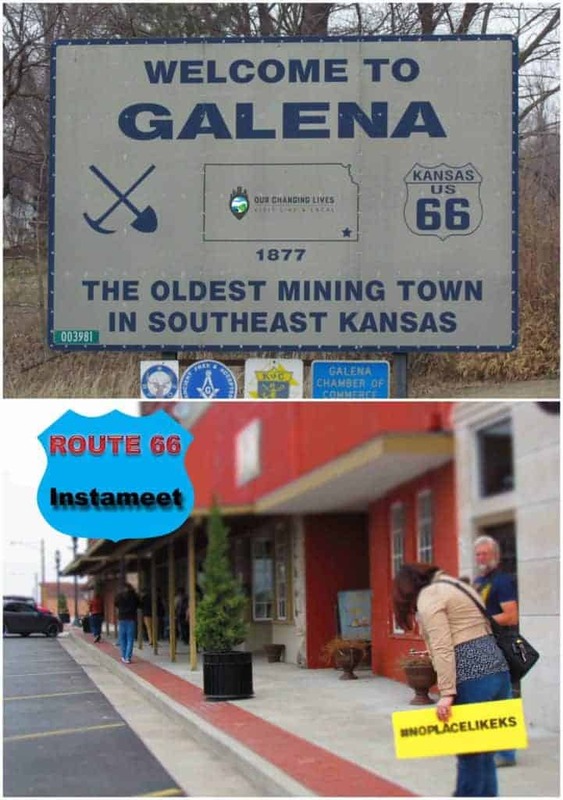 The original Route 66 passes through Galena as it enters the state of Kansas. While Kansas can only boast 13 miles of the Mother Road, they are considered some of the best preserved along the route. For those fans of the movie “Cars”, it is interesting to note that many of the buildings in Galena were inspiration for ‘Radiator Springs” in the 2006 Pixar animated movie. We arrived a little before the Instameet was to begin, so a decision was made to check out a site a little off of the route. Schermerhorn Park lies near the southern end of town, but only a couple minutes from where we were meeting. 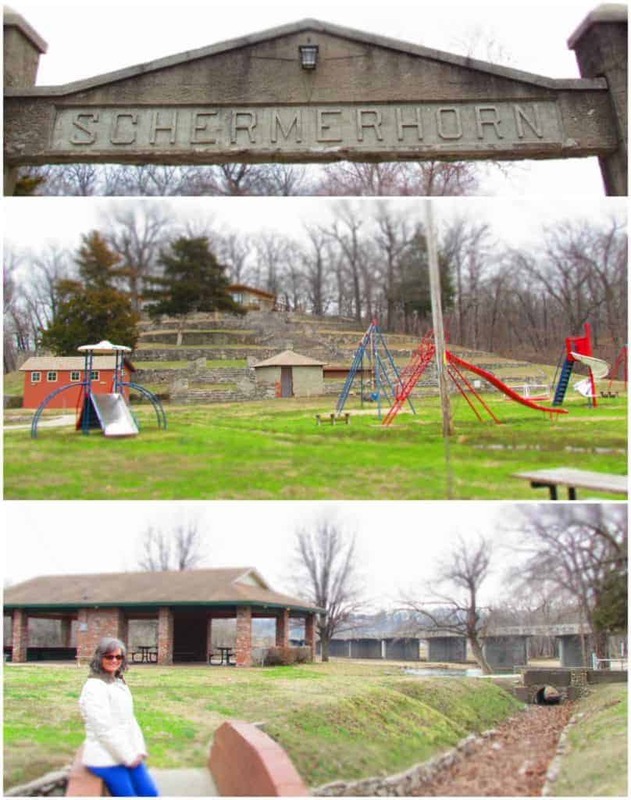 This local park was formed in the 1920’s, and additions were made during the WPA program of the 30’s and 40’s. These include the terraced walls and nature center that occupy the nearby hill. Our time was short, so we didn’t have a chance to visit the nearby Schermerhorn Cave. We will have to schedule another visit, and maybe see some of the rarest creatures in Kansas. For now, it was time to head back downtown to meet up with the others. By the time we made it back, one group had already headed off to explore. Us stragglers took off to catch up with them. Our tour guide, a Galena native, spent the next couple of hours walking us through the historical significance of the buildings we passed. As we toured, our camera shutters clicked away, capturing minute details from our visit. We often wonder what the local residents think of a group like ours, when they spy us taking pictures of others taking pictures. Hopefully, they all understand that the end goal is to show those we connect with some of the highlights from the places we visit. Some of the most popular items to photograph are the “ghost signs” that are found on the sides of buildings. These age old advertisements are wonderful material to share, and they hearken back to the days when Route 66 was the main thoroughfare through the heartland. Of course, these aren’t the only reminders of days gone by. 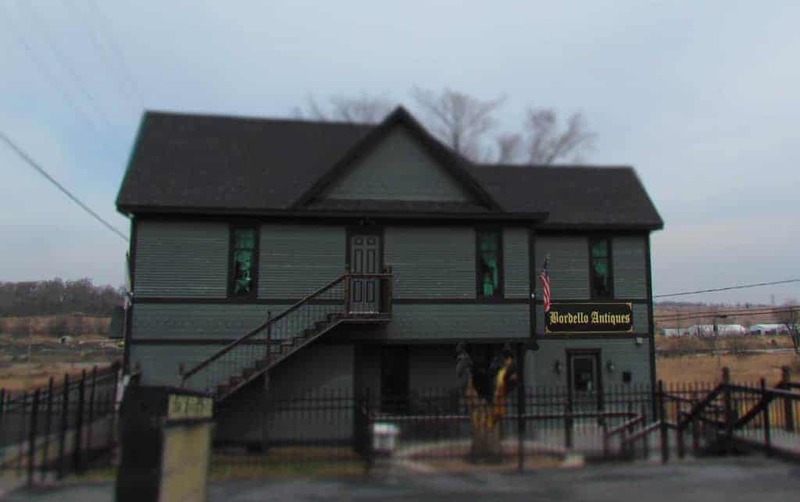 The building pictured at the top of this article has its own unique place in Galena history. The site was reputed to be the home of a local bordello, which was owned by a local family. A series of murders on the property raised much suspicion, and finally led to the arrest of three family members for the robbery and murder of a miner. A group of vigilantes burned the original structure to the ground. The replacement now holds an antique shop. Our tour guide led us to a revamped filling station named, Cars On The Route. 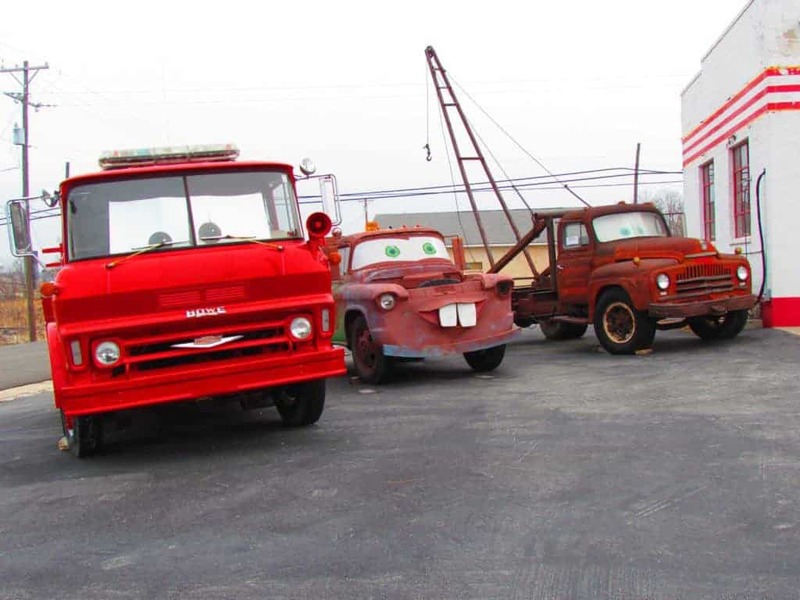 This place is part of the inspiration for the Cars movie, and the old truck looks a lot like Tow Mater. Here we had a chance to meet Melba “The Mouth”, who explained the history of this little filling station. (Read more about this station here>) Obviously, this place was a major draw for people with cameras. Inside and out, the station held chances for memorable pictures, and interesting stories. While the majority of the group continued down the route, I paused for a more in-depth look. When I realized that they had all departed, I hurried down the block to catch up. 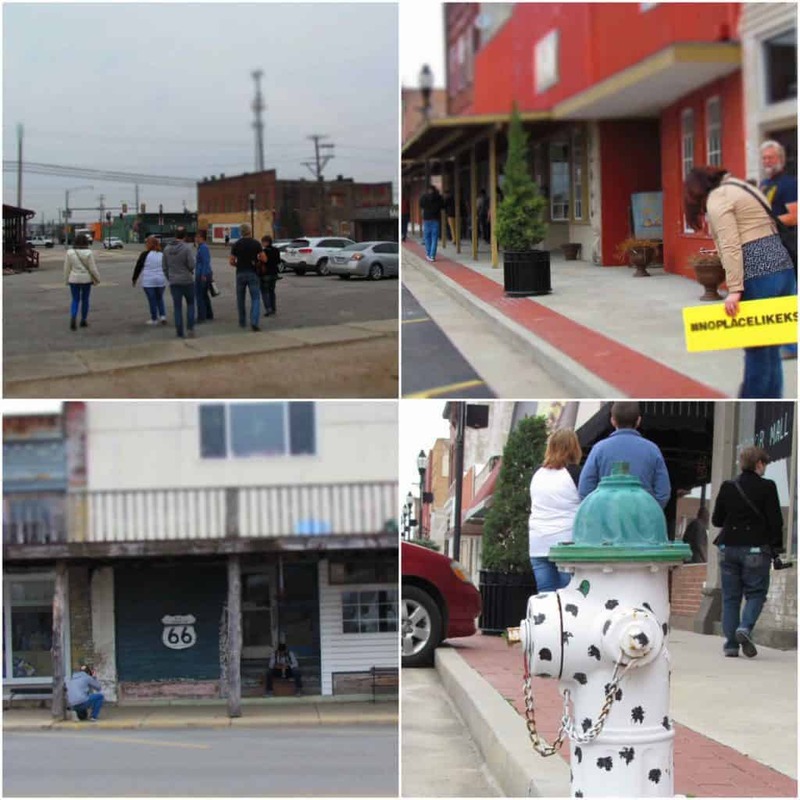 The group had turned onto Front Street, which is the portion of Route 66 that leads to the state line. They had worked their way down a couple of blocks, but stopped just short of a bridge that leads the last mile to the Kansas-Missouri border. I found Crystal about half way to the bridge, and we decided that this stretch offered unique opportunities. With very few vehicles passing at that time of day, I thought a selfie would be cool. A reasonably crisp “Route 66” marking would make a great addition to the shot. It took a few times, but we finally got a picture we both loved. Fortunately, we only had to move once for a passing vehicle. We did notice others taking pictures of us taking a selfie. Instagrammers! We were running behind on the schedule timeline, and still had one more stop in town. Our guide corralled us, and started the march back downtown. Our destination was the Galena Mining & Historical Museum. 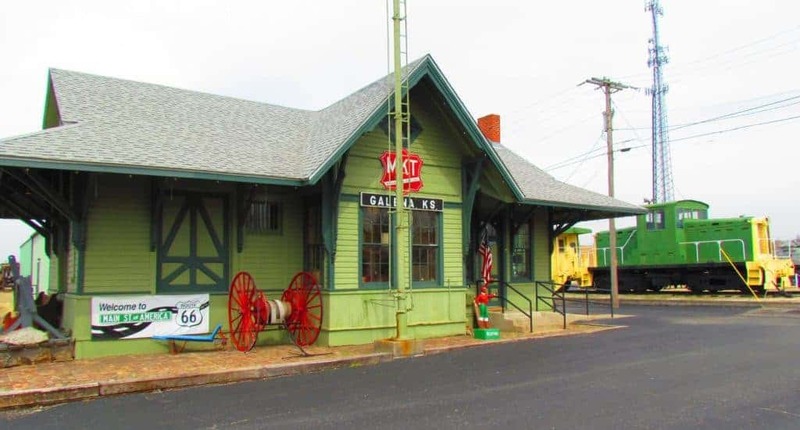 Housed in an old Katy train depot, the museum offers artifacts from the town’s history, as well as mining in the region. It opened in this location in 1984, and has exhibits inside, as well as on the grounds. Once inside, the volunteers took over our tour, as they guided us through the displays. From the outside, the museum looks as small as the old railroad depot. Inside we soon realized that there was an additional space, which had been added to the back of the building. This was done in a way that didn’t detract from the aesthetics of the original structure. The guide showed off the large collection of artwork by local artist Carol Bliss-Riley. These paintings of abandoned mines were once displayed at the Smithsonian, but have returned home. Various vehicles from the past show the timeline of advancements, since the early days of Galena. Another display showcases the television station that used to operate in the area. I had to wonder if it was one of the three stations that I would watch on my grandparents TV set in West Mineral. The museum also houses an extensive collection of mining equipment and mineral specimens. We stayed for a bit, but knew that we needed to hurry down the road to our next Route 66 stop. In the future we will have to plan a return visit to better explore this Kansas town. Have you ever visited Galena, Kansas? Drought is severe to extreme in south-central and southwest Kansas. There is no denying that fact! No surprise to me whatsoever about the drought emergency. Since July 1st, precipitation deficits are running 8-12 inches below normal. If these rains do occur for eastern Kansas / western Missouri (which will of course miss most of the worst drought areas in Kansas), that is very good news for you. There is tremendous worry and despair in my neck of the woods. In Kansas City we are not in the worst drought region, but it has continued to be very dry. Let’s hope that this situation sees a much needed change this Spring.